Don’t limit yourself to just one cooking experience if you have the space on your property to create an area that your family and friends will adore. You love to cook and you love being outdoors. How about marrying those two passions by bringing your kitchen outside? Don’t limit yourself to just one cooking experience if you have the space on your property to create an area that your family and friends will adore. Build a stunning focal point that will add value to your property and your experiences living there. Spend more time with your family and friends outside with an outdoor kitchen. Work with professionals to design the perfect layout for your space. Instead of walking food back and forth to the outside from your indoor kitchen, plan the perfect afternoon or evening by bringing all your food and supplies outside and staying there to enjoy the company of everyone. You’ll be able to eliminate the cook having to be inside and isolated from everyone with their workspace outside, in the middle of the action. In general, spend more time in your outdoor living space to fully enjoy the weather of the season. 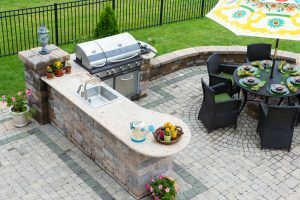 More birthday parties, cookouts, and other celebrations will be on your agenda when you add an outdoor kitchen to your home. With all your guests outside enjoying the lovely weather, you’ll be able to keep your home tidy and fresh. You’ll also be able to invite more guests by utilizing the functions and appliances of both of your kitchens, if needed. The space will serve as a great conversation starter and will be sure to make a lasting impression on all your guests. You’ll see an immediate increase in the value of your home by adding an outdoor kitchen to your property. A high quality, well-built outdoor kitchen is an attractive addition that extends the living space, enhances the overall experience of living on that property, and improves the overall attractiveness of the neighborhood. These features are desirable to homebuyers as they provide a unique living experience that homebuyers would jump to have. This entry was posted on Friday, September 8th, 2017 at 1:46 pm. Both comments and pings are currently closed.